Ever wondered where the Harvey Maps 1:40,000 map scale came from and why? Recently Harvey Maps introduced a new map type called the XT40, a very small format folded into almost a quarter of normal map size and its narrow width allows you to keep your thumb on your position. As with an orienteering map. Back in 1976 I was lying safely in my tent at the KIMM 2 day MM overnight camp in Galloway, SW Scotland as the heavens opened and rain sluiced down at 6pm nightfall. We could see lights coming down the hillside: runners were attempting to fight their way through the forest and around the lake. The lucky ones hit a track which was unmarked on the map; the unlucky were timed out of the competition. 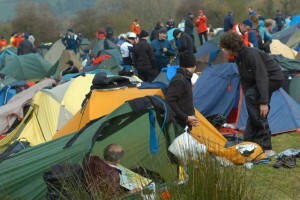 The organiser, Gerry Charnley had assumed that the new Ordnance Survey 1:50,000 scale introduced that year would be a new survey. It wasn’t – it was simply the old map resized. The 1977 KIMM saw the whole competition held in the Howgills, on a new 1:40,000 scale map. This was revolutionary since at that time the area was split over no less than four published Ordnance Survey maps. Here is how it came together. Here, for the first time, is the inside story from Harvey Maps. Going back to 1976, I do remember it well. Getting across that marsh and deep deep ditches to the campsite was so tough – without knowing there was a forestry road so close. That was what inspired us to propose to Gerry that we could do better. I had just finished a course in Photogrammetry at Glasgow, and done the WOC ( World Orienteering Champs ) maps for the event in Scotland. We were planning to try setting up a business full time mapping for orienteering maps, and a mountain navigation map seemed a great idea. We spent the winter of 76/77 discussing the specification of a potential mountain map with Gerry. I was keen to use the unusual scale of 1:40,000 as a compromise between the traditional 1:25,000 and 1:50,000 scales. The map would be compact, but large enough to show the detail we felt was important. Cost was a big item. 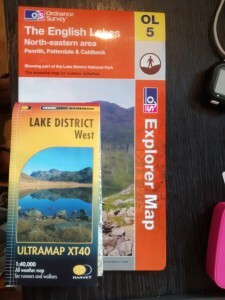 We reckoned we could make it work if part of the initial cost were covered, and the map was subsequently marketed as the first in a new series of recreation maps. Gerry was keen and approached you as a sponsor. We always knew that we would have to generate enough maps in the series to make the whole thing viable. Initially it was the KIMM maps but we added others over time. I don’t think we had a clear idea of how many we would need. Since then we have gone with 1:40,000 and 1:25,000 scales. Our Superwalkers at 1:25,000 do well, but I have to say I am glad that the original 1:40,000 scale still has a lot of support. The BMC wanted it for the British Mountain Maps, our National Trail maps have always used it. It is the ideal scale for the new ‘pocket perfect’ XT40 Ultramaps.